This tool is a must when adjusting tension of quick turn springs. Simply turn knob on adjuster to evenly pull or push spring without kinking or breaking spring. 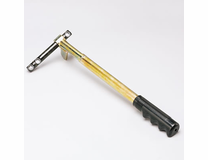 Valvespring tool fits 361, 383, 400 & 440 Cylinder heads with cast-in rocker shaft pedistals. Fits: Up to 700 lbs. Fits: On Head, 0-600 lbs/in.